English for Medicine is a skills-based course designed specifically for students of medicine who are about to enter English-medium tertiary level studies. It provides carefully graded practice and progression in the key academic skills that all students need, such as listening to lectures and speaking in seminars. It also equips students with the specialist medical language they need to participate successfully within a medical faculty. Extensive listening exercises come from medical lectures, and all reading texts are taken from the same field of study. There is also a focus throughout on the key medical vocabulary that students will need. The Teacher's Book includes: Comprehensive teaching notes on all exercises to help teachers prepare effective lessons Complete answer keys to all exercises Full transcripts of listening exercises Facsimiles of Course Book pages at the appropriate point in each unit Photocopiable resource pages and ideas for additional activities. 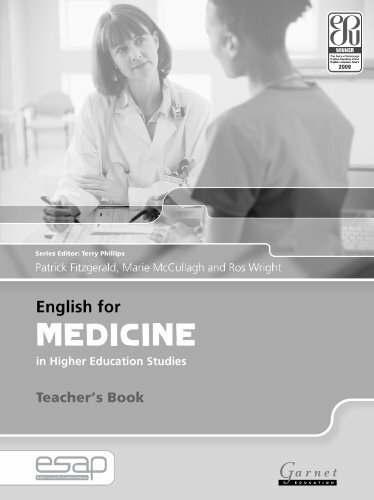 English for Medicine in Higher Education Studies The Garnet Education English for Specific Academic Purposes series won the Duke of Edinburgh English Speaking Union English Language Book Award in 2009. English for Medicine is a skills-based course designed specifically for students of medicine who are about to enter English-medium tertiary level studies. It provides carefully graded practice and progression in the key academic skills that all students need, such as listening to lectures and speaking in seminars. It also equips students with the specialist medical language they need to participate successfully within a medical faculty. Extensive listening exercises come from medical lectures, and all reading texts are taken from the same field of study. There is also a focus throughout on the key medical vocabulary that students will need. The Teacher's Book includes: * Comprehensive teaching notes on all exercises to help teachers prepare effective lessons * Complete answer keys to all exercises * Full transcripts of listening exercises *Facsimiles of Course Book pages at the appropriate point in each unit *Photocopiable resource pages and ideas for additional activities The Garnet English for Specific Academic Purposes series covers a range of academic subjects. All titles present the same skills and vocabulary points. Teachers can therefore deal with a range of ESAP courses at the same time, knowing that each subject title will focus on the same key skills and follow the same structure. Key Features * Systematic approach to developing academic skills through relevant content. * Focus on receptive skills (reading and listening) to activate productive skills (writing and speaking) in subject area. * Eight-page units combine language and academic skills teaching. * Vocabulary and academic skills bank in each unit for reference and revision. * Audio CDs for further self-study or homework. * Ideal coursework for EAP teachers.